Theresa May has survived a vote of no confidence in her leadership but to quote the prime minister: “Nothing has changed.” The Conservative Party remains just as divided as it was before. While divisions over Europe have been very prominent recently, they have been a thorn in the side of the party leadership for many years now. That said, looking at the situation today it’s hard to imagine how these rival ideologies have managed to coexist within the same party for so long. While there has always been some hostility in the party towards the European project, the nature of this hostility has evolved over time. In the 1975 referendum on EEC membership the party was largely in favour of remaining. 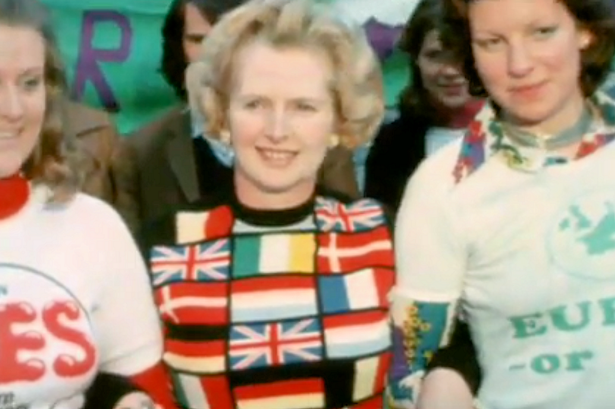 Even Margaret Thatcher wore a very colourful, very European jumper to express her support of continued membership. Of course, Thatcher’s views on the European project would change over time as institutions themselves changed and evolved. This inevitably had a significant impact on the party’s future ideology. However, arguably the key turning point came on September 16 1992 – otherwise known as Black Wednesday. This was when the government of John Major had to withdraw the pound from the Exchange Rate Mechanism. The crisis made the party deeply unpopular with the electorate and had a profound effect on how its MPs viewed the European Union. Many turned sour on the UK’s membership, which changed the nature of the party’s divide over Europe. What was once a debate about the ins and outs of Britain’s place in Europe became a polarisation between soft and hard euroscepticism. While some europhiles remained, their numbers started to dwindle over time. Older MPs were replaced by fresher and younger MPs, most of whom were, at the very least, sceptical of the EU – and many of whom were in fact very hostile. This group was growing restless during the Conservatives’ long period in opposition under New Labour and looked back to the glory days under Thatcher for the solution to reclaiming Number 10. Euroscepticism became a key theme to emulate. The UK’s continued membership of the EU became an increasingly salient issue, not least because some voters started to oppose the free movement of people that came as part of the package. New right-wing party UKIP capitalised on negativity towards European immigration to become a real electoral threat to the Conservatives. The 2016 referendum was the then leader David Cameron’s attempt to stave off this UKIP threat. Like many in the political class, he believed that people would vote to remain in the EU and that the debate that haunted his party would be put to bed once and for all. However, after years of lukewarm support for Europe and a lack of engagement with the public hostility, pro-European MPs struggled during the short campaign period to convince enough voters that the UK’s membership of the European Union was actually a good thing. With the victory of the Leave campaign in 2016, figures who were once on the periphery of their party were suddenly catapulted into to the forefront. They have positioned themselves as the guardians of the “will of the people” ever since. The big question is: where does the party go from here? Although May is safe from another leadership challenge for the next year, those who voted against her are still insisting that she should take the hint and resign. The vote has not unified the party – nor has it really stabilised anything. As things stand, reconciliation between the warring factions seems unlikely, so they will have to try to coexist for a while longer, although this will probably prove difficult given that the malcontents can, and likely will, continue to stir up trouble for the prime minister. Given that they failed to oust their leader through the official mechanisms, the likes of Boris Johnson and Jacob Rees-Mogg may have to refocus their efforts and put pressure on her to simply resign instead. This is something that May has claimed she will do before the next general election, but it is unlikely her opponents will be willing to wait for this to occur naturally. Their most likely tactic will be to oppose and undermine May’s Brexit withdrawal agreement regardless of what, if any, amendments the prime minister can secure. The almost inevitable failure to get the agreement through parliament, they may hope, will make May’s position untenable. Failing that, there is always the option of trying to orchestrate a vote of no confidence in the government, thus forcing a general election. But while many key figures have regularly put self-interest before their party, it seems unlikely that they would want to side with rival parties to bring about such a vote, especially when these other parties may very well fare much better in the election than their own. May’s struggles are not over – and her credibility may never recover. But voters dislike divided parties and, if the different factions continue to pull further apart, it may not be just their leader whose days in office are numbered.